"There’s a traveling man the Carolina mountain folk call Silver John for the silver strings strung on his guitar. In his wanderings John encounters a parade of benighted forest creatures, mountain spirits, and shapeless horrors from the void of history with only his enduring spirit, playful wit, and the magic of his guitar to preserve him. Manly Wade Wellman’s Silver John is one of the most beloved figures in fantasy, a true American folk hero of the literary age. For the first time the Planet Stories edition of Who Fears the Devil? collects all of John’s adventures published throughout Wellman’s life, including two stories about John before he got his silver-stringed guitar that have never previously appeared in a Silver John collection. 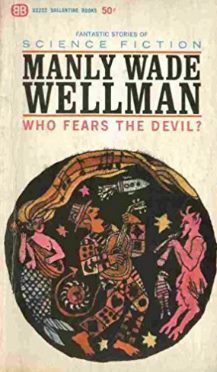 Lost, out of print, or buried in expensive hardcover editions, the seminal, unforgettable tales of Who Fears the Devil? stand ready for a new generation ready to continue the folk tradition of Silver John." July, the month in which we Yanks celebrate our 1776 edition of Brexit, makes the perfect month to read the most American fantasy book that I've ever read. Although, I must confess a nostalgic love for the trippy Ballentine cover. Note that back then, the name had top billing, not the title. We readers have so lost our heritage that even the sort of voracious reader who starts an on-line book club had never heard of Manly Wade Wellman until reading him by way of Jeffro by way of Gygax. It's time to dust off this American treasure and bask in its New World charms. Labels: Who Fears the Devil? Who Fears the Dark Places?